The stationery grill you always wanted. In response to numerous requests for a built-in barbecue with the same professional grilling features as the standard Silver Giant, we are proud to present the Silver Giant Built-In models. You can customize the style of non-combustible surround for your Silver Giant - be it brick, ceramic tile, cut stone, or marble. The Built-In models are available in all four sizes, propane or natural gas, with the same over-sized cooking surfaces featured on all Silver Giant grills. 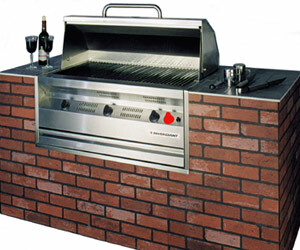 Create your very own outdoor cooking center in the backyard or on the deck. This is customized grilling elegance at its finest. 29.25" 41.25" 53.25" 65.25" 77.25"
24.75" 27.75" 27.75" 27.75" 27.75"
17-3/8" 17-3/8" 15-3/8" 15-3/8" 15-3/8"